AP/Wide World Photos. Reporoduced by permission. Josh Groban is not a typical twenty-something pop singer, and record store owners have had a tough time deciding just what bin to put his CDs in. Many of his songs are contemporary romantic ballads, but Groban, who is classically trained, also performs opera and sings classical songs in Italian, Spanish, and French. Regardless of the fact that he defies classification, Groban's fans number in the millions, and they have no problem locating or buying his music. Since bursting on the scene with his debut album in 2002, the gangly Groban has become a music phenomenon. He was the best-selling new male artist of 2002, and since then he has toured the world, performing to record-breaking crowds of all ages. 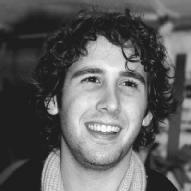 Joshua Winslow Groban was born February 27, 1981, in Los Angeles, California. According to Groban, both of his parents were quite artistic and instilled in their children a love of theater and music. His mother, Melinda, was an artist and interior designer. His father, Jack, a businessman who owned his own executive recruiting company, was an accomplished pianist who could play piano by ear. Groban inherited his piano-playing skills from his father. He also credits both his parents for introducing him to a wide variety of musical styles. Groban was drawn to musical theater and opera, counting Mandy Patinkin (1952–) and Luciano Pavarotti (1935–) as two of his idols. At the same time, he listened to pop musicians. In Interview, Groban explained to Renee Fleming that he was especially interested in artists "who decided not to settle into one particular musical style—people like Paul Simon, who took folk music and put African music on top of it." He was referring to American singer-songwriter Paul Simon (1941–) and his award-winning Graceland album, which was the first CD Groban ever received as a gift. Although he was inspired by music from an early age, Groban was not an early singer. He eventually took a vocal class in junior high school, but as he admitted on his Web site, he really joined because all the other kids were joining. A turning point came in the seventh grade when his teacher auditioned students to sing in the school's variety show. Groban wowed the teacher with his voice and was tapped to perform a solo. The number was a song written in the 1920s by the famous American composers George (1898–1937) and Ira Gershwin (1896–1983). While it showcased Groban's rich voice, it did not make him particularly popular with kids his own age. "When you're in the seventh grade and everybody's listening to rap, it's not the coolest thing to discover you have a voice like mine," he told Fleming. "I'm not performing for the classical crowd or the Britney crowd. I'm performing for people who like all different kinds of music." After the performance, however, Groban had a revelation. As he explained to Fleming, "I realized that this was something I could do to stand out and express myself in a way that I didn't normally know how to do. And that became something very powerful." As Groban grew older and his voice matured, it became apparent that he had real talent. He was accepted into the Los Angeles County High School for the Arts, where he studied musical theater and acted in many school plays, in the hope that one day he would sing and act professionally. The chance came sooner than he expected. When he was seventeen years old, Groban's voice teacher, Seth Riggs, was contacted by Grammy Award-winning producer and composer David Foster (c. 1950–), who was looking for someone to sing at some upcoming celebrity events. Riggs sent Foster tapes from several of his students, but it was Groban's recording that caught Foster's attention. "It floored me," the producer told People in 2002. Foster immediately booked him to perform at the 1999 inauguration of California Governor Gray Davis (1942–), which took place in Sacramento, California. A very nervous Groban found himself singing in front of a crowd of twenty thousand. A few weeks later, Celine Dion (c. 1968–) was slated to sing a duet with Italian opera star Andrea Bocelli (1958–) on the Grammy Awards program. Bocelli, however, was unable to rehearse, and Foster asked Groban to fill in. At first Groban said no, since he was given only a few hours' notice. "I didn't want to go in there unprepared," he told Bob Brown of ABC News. He relented, however, realizing that this was a once-in-a-lifetime opportunity. When he took the stage with Dion, he was enthusiastically praised as the young man with the impressively grown-up voice. Comedian Rosie O'Donnell (1962–), who was hosting the awards program, took a quick liking to Groban and invited him to appear on her talk show, dubbing him Opera Boy. Foster continued his partnership with Groban, and invited him to perform at a number of high-profile events. At one of these events, Groban drew the interest of television writer and producer David E. Kelley (1956–). At the time, Kelley was working on the hit TV series Ally McBeal and thought that Groban would be perfect for an upcoming episode. In the show's 2001 season finale, Groban appeared as Malcolm Wyatt, a nerdy high school senior who sues a fellow classmate for breaking their prom date. Of course, Kelley made sure that Groban's singing was a key part of the script. After the episode aired, thousands of viewers called and wrote in to the Fox network inquiring about the talented young newcomer. Meanwhile, Groban had graduated from high school and was planning to attend Carnegie Mellon University in Pittsburgh, Pennsylvania, to continue studying musical theater. Foster, however, approached him with the news that executives at 143 Records, a joint venture between Foster and Warner Brothers, were interested in signing a record deal. Groban thought long and hard, but ultimately decided to put college on the back burner and take the plunge into the music business. Initially, record company executives were not sure how to approach Groban's first album. With his boyish good looks, they first thought that Groban should focus on pop songs. But his classical training prompted them to consider an album including Italian opera. In the end, Foster stepped in and worked to produce Groban's 2001 self-titled debut album, which included a blend of contemporary rock and pop tunes along with classical music in English, Spanish, and Italian. Such a combination was difficult to market in the fast-paced world of MTV, so the record company took a variety of approaches to promote their new artist. Groban was invited back to appear on a holiday episode of Ally McBeal in late 2001. He also appeared on numerous talk shows, from Oprah to the Tonight Show with Jay Leno. Groban was even featured on the prime-time news program 20/20. Following the media blitz, album sales soared and Josh Groban Web sites popped up all over the Internet. But the media blitz was just getting started. Groban went on to make countless public appearances, with one major highlight coming in early 2002. When he took the stage to sing with Welsh soprano Charlotte Church (1986–) at the closing ceremony of the Winter Olympics in Salt Lake City, Utah, Groban was heard by an estimated 1.6 billion people around the world. In late 2002 Groban was given a major opportunity when he taped a live concert that was aired on PBS in December. The twenty-year-old took the stage with a variety of music heavyweights, including Andrea Corr (1974–), lead singer of the Irish traditional/pop group The Corrs, and the legendary American composer John Williams (1932–). At the same time, Groban released his second album, Josh Groban in Concert, a DVD-CD combination based on the PBS special. It debuted at number thirty-five on the Billboard Top 200 chart and quickly reached number one on the music video charts. Thanks to an unprecedented amount of media coverage, Groban's fan base grew by leaps and bounds. He was especially popular on the Internet, where his CD enjoyed increasing sales. One record executive, as quoted on ABC News, called him "the first Internet star." An on-line community of fans who called themselves Grobanites helped to boost sales. Another site called Friends of Josh Groban became a one-stop shopping network where fans could order concert tickets, albums, and get up-to-the-minute news about their favorite singer. Fans did not have to wait too long to hear more of Groban, since he was back in the studio in 2003 to put together his third album. For seven months he worked with producers to choose, arrange, and record songs. Groban also spent time writing songs, three of which appeared on the final cut. As he explained on his Web site, "This time I've tried to open the door as wide as possible. These songs are a giant step closer to who I really am and what my music is all about." As a result, the album was titled Closer. As exhilarating as the experience was, however, Groban admitted that it was also daunting. In the same Web site article he confided, "I felt tremendous pressure to repeat the success of the first album.... The challenge became not so much reaching the bar I had already set, but setting it higher." When Closer was released in late 2003, it received mixed reviews. While most critics praised Groban's powerhouse voice, they also believed that his delivery was somewhat immature and lackluster. Reviewers were especially critical of Groban's pop songs. Chuck Arnold of People called them "over-the-top ballads," and Scott Paulin of Entertainment Weekly dismissed them as "depressingly predictable." Arnold went on to suggest that Groban, with his classically trained voice, should stick to singing in Italian, Spanish, and French. "As it is," Arnold wrote, "this is a disc only Grobanites will love." And Grobanites did love it. The first week it was released, Closer rocketed to number four on the Billboard chart, and by mid-2004 it had sold more than four million copies. In January of 2004 Groban embarked on his first world concert tour, with stops slated in the United States, France, England, Norway, and Sweden. When tickets went on sale, they sold out almost immediately. Fans of all ages flocked to Groban's shows, which were decidedly more mellow than the usual rock concert. In an interview with Bob Meadows of People, Groban joked that "the security guards at my shows don't have anything to do." Fans may have been more well-behaved, but they were also incredibly devoted. One woman told Meadows that she had seen Groban in concert forty-four times. People in the music industry were amazed at the sellout crowds, but one Billboard insider, Geoff Mayfield, tried to explain the phenomenon in People : "I think it's a personal connection. [Groban] seems accessible as a human being, with that otherworldly voice." 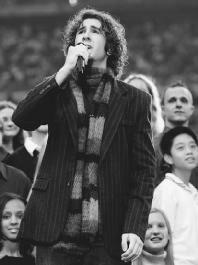 Josh Groban performs at the 2004 Super Bowl. Since being discovered by Foster in 1999, Groban has been working almost nonstop, either traveling, performing, or in the recording studio. He does not complain, but does admit that life on the road is not that glamorous. Days are long and filled with voice lessons, sound checks, and rehearsals. To pass the time, he reads, watches movies, and plays video games. Groban is also an avid drummer. He learned to play when he was about sixteen years old, and as he explained to Fleming, "It's a great way to get all the stress out." Few young people gain so much success at so early an age, but Groban seems to be handling it well. He commented that his biggest extravagance has been to buy a Porsche. He also views his career with a mature eye. While he is trained to sing opera, he does not see himself recording or performing any major arias for some time. "When I do them," he told Fleming, "I want to do them right." And Groban still has his sights set on Broadway. He came one step closer to his dream in September of 2003, when he appeared in a one-night-only benefit performance of the play Chess at the Amsterdam Theater in New York City. There appears to be much more ahead for the boy with the "bottomless lungs." When asked by Fleming where he sees himself in ten years, he replied, "I'd like to be able to say that I put my foot in a little of everything, but that I did it intelligently. And if I make mistakes, I want to know that I learned from them." Arnold, Chuck. Review of Closer. People (December 1, 2003): p. 46. Fleming, Renee. "Josh Groban: So How Did Josh Groban Manage to Woo Millions of Hearts with Just His Set of Prodigious Pipes?" Interview (March 2004): pp. 140–145. Meadows, Bob. "Josh Groban: Why are Grandmothers and Tweeners Screaming Their Heads Off at the Same Concert? To Catch America's Hottest Crooner." People (June 21, 2004): p. 117. Paulin, Scott. Review of Closer. Entertainment Weekly (November 14, 2003): p. 122. Brown, Bob. "A Star in the Making: Who is Josh Groban?." ABCNews. com: 20/20 http://www.abcnews.go.com/sections/2020/DailyNews/2020_joshgroban_020412.html (accessed on June 20, 2004). Josh Groban Web site. http://www.joshgroban.com (accessed on June 18, 2004). Great young man, can never go hungry, for he fits in to a world of all age of music. He is a universal bliss! What did he release, "You raise me up"?